girl, i am so glad you like it!! Sounds like a great product!! $16, I suppose ain't too bad if you really like it. Have a great weekend, sis! I keep hearing good things about this. I want to try it soo bad, I just wish you could buy it in stores. Amina thanks for blogging about this a while ago. I am so glad I made my purchase and I am going back for more!!!! lol I know you already received the list of what I purchased from the other thread. Dasia Yes I really like this conditioner it is so good and the hand lotion (wonderful) and I got a air mask too which I will probably post this week. KBB has a store in Brooklyn NY but it is not sold anywhere else to my knowledge. The KBB store is on myrtle avenue in BK. If you call the number on the website, you will get more info. You are not kidding. When I first tried the hair milk, that was basically all used and I really liked it, ut over time it just didnt seem as effective. Or it could be that I just found better product and lost interest in the milk. 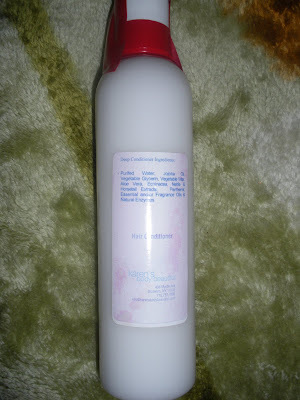 I will say that this KBB conditioner is now officially a staple, I even ordered more yesterday. really good stuff.